While exporting iGoogle feeds to OPML could be used if you want to move your feeds to another service, importing feeds from an OPML file is a good way to add a large number of feeds to iGoogle. * Bloglines has a link in the main interface: "Export Subscriptions"
* to export Firefox's live bookmarks, install an extension. I only tested the script with the OPML files exported by Google Reader, Bloglines, Netvibes, My Yahoo and Windows Live Personalized Homepage, so the conversion might not work for other feed readers. 3. What you got is the content that needs to be added at the bottom of iGoogle's settings file. Log in to your Google account, go to iGoogle's settings page and scroll to the Export / Import section. Click on "Export" to download iGoogle-settings.xml, a file that contains a list of all your gadgets, feeds and their settings. Don't close the iGoogle settings page because you'll need to import the file later. 4. Backup your iGoogle settings file. Create a copy of the iGoogle-settings.xml file, just in case something goes wrong. You'll be able to import the settings and go back to a working iGoogle. 5. 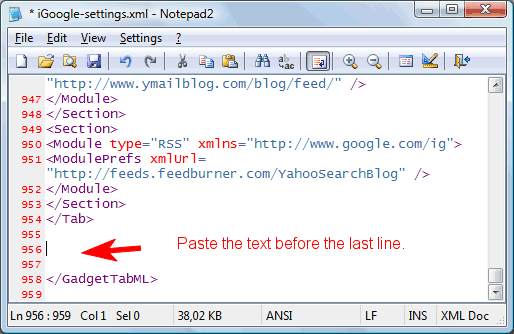 Open iGoogle-settings.xml in a text editor and add the text obtained at the step #2 before the line that contains </GadgetTabML> (the last non-blank line), like you see in the screenshot. 6. Save the file and import it to iGoogle settings, in the Export / Import section. All folders from the OPML file should be converted to iGoogle tabs, which can be renamed and reordered in the settings. iGoogle doesn't save the state of an item (read/unread) and only lets you see up to 9 recent items from a feed, but it's a great dashboard for your feeds. Thank you! I just needed it! That was very useful. I hope iGoogle will soon be able to natively use OPML. I wonder why iGoogle do not process opml files directly. Where did you get the OPML file from? It should work with OPML files obtained from Google Reader, Bloglines, Netvibes, My Yahoo etc. Thanks, your guide was a great help. Ridiculous that it's this hard to move your opml from Google Reader to iGoogle though! i had the same problem as laura, trying to port from google reader to igoogle. any ideas? Did this with a OPML file from Netvibes, and it only imports TAb names, not Feeds !!!! I am running into the same problem as Wenny. I've written a Q&D perl script to generate iGoogle format tab configuration out of a Netvibes OPML export, which imports both Tab names and RSS feeds. A lot of formatting is lost out of the process, but one can manually configure it later. I use netvibes but the lack of a synchronized webapp for mobile device push me to turn to igoogle (with a great mobile UI). Unfortunately, I do not succeed to import a xml file with a correct format in igoogle. I believe the converter from netvibes opml file to igoogle xml file does not work anymore. It turns out that Netvibes updated the way it formats OPML files. I tweaked the script and it should now support Netvibes OPML files once again. Sorry for the inconvenience. I'm getting an error "The file could not be imported. Please make sure it's correctly formatted and then try again." Not quite sure what I'm doing wrong. I had the same error. Solved by removing any accutuated letter from the resulting XML (é, à, è, É etc.). Hope this helps. for one reason, from my current ISP netvibes is not available. With the import I have all my content back! Thx!!! How do you create a file or "label" to help manage your bookmarks on igoogle? ?